Definition at line 47 of file llviewborder.h. Definition at line 50 of file llviewborder.h. Definition at line 52 of file llviewborder.h. Definition at line 47 of file llviewborder.cpp. Definition at line 91 of file llviewborder.cpp. References LLView::draw(), drawOnePixelLines(), drawTextures(), drawTwoPixelLines(), FALSE, LLView::getVisible(), llassert, mBorderWidth, mStyle, mTexture, STYLE_LINE, and STYLE_TEXTURE. Definition at line 130 of file llviewborder.cpp. References BEVEL_IN, BEVEL_NONE, BEVEL_OUT, bottom, f, LLFocusMgr::getFocusColor(), LLFocusMgr::getFocusFlashAmt(), LLRectBase< Type >::getHeight(), LLRectBase< Type >::getWidth(), gFocusMgr, gl_line_2d(), glColor4fv, left, lerp(), llassert, mBevel, mHasKeyboardFocus, mHighlightLight, LLView::mRect, mShadowDark, LLColor4::mV, right, S32, LLUI::setLineWidth(), and top. Definition at line 244 of file llviewborder.cpp. References drawTextureTrapezoid(), f, FALSE, LLRectBase< Type >::getHeight(), LLRectBase< Type >::getWidth(), glColor4fv, llassert, mBorderWidth, LLView::mRect, mTexture, LLColor4::mV, and UI_VERTEX_COLOR. Definition at line 263 of file llviewborder.cpp. References f, glBegin, glEnd, glPopMatrix, glRotatef, and glTranslatef. Definition at line 178 of file llviewborder.cpp. References BEVEL_BRIGHT, BEVEL_IN, BEVEL_NONE, BEVEL_OUT, bottom, LLFocusMgr::getFocusColor(), LLRectBase< Type >::getHeight(), LLRectBase< Type >::getWidth(), gFocusMgr, gl_line_2d(), glColor3fv, left, llassert, mBevel, mHasKeyboardFocus, mHighlightDark, mHighlightLight, LLView::mRect, mShadowDark, mShadowLight, LLColor4::mV, right, S32, and top. Definition at line 340 of file llviewborder.cpp. References BEVEL_IN, border, getBevelFromAttribute(), LLViewBorder(), S32, and STYLE_LINE. 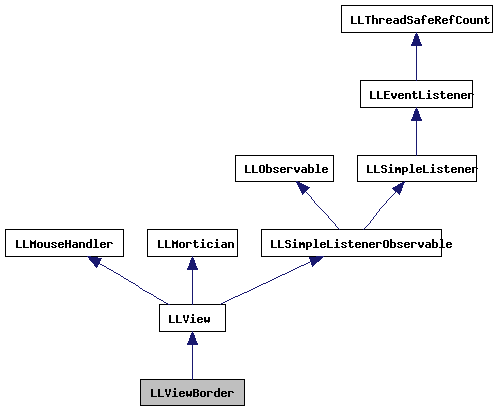 Definition at line 75 of file llviewborder.h. Definition at line 295 of file llviewborder.cpp. References BEVEL_BRIGHT, BEVEL_IN, BEVEL_NONE, BEVEL_OUT, and LLStringBase< char >::toLower(). Referenced by fromXML(), LLLineEditor::fromXML(), and LLPanel::setPanelParameters(). Definition at line 77 of file llviewborder.h. Referenced by LLScrollableContainerView::calcVisibleSize(), LLScrollableContainerView::getBorderWidth(), LLLineEditor::getXML(), LLScrollableContainerView::reshape(), and LLScrollableContainerView::updateScroll(). Definition at line 76 of file llviewborder.h. Definition at line 334 of file llviewborder.cpp. Definition at line 329 of file llviewborder.cpp. Definition at line 65 of file llviewborder.cpp. Definition at line 69 of file llviewborder.h. Definition at line 68 of file llviewborder.h. Definition at line 70 of file llviewborder.cpp. Definition at line 76 of file llviewborder.cpp. References mHighlightDark, mHighlightLight, mShadowDark, and mShadowLight. Definition at line 79 of file llviewborder.h. Referenced by LLTextureCtrl::draw(), LLTextEditor::draw(), LLScrollListCtrl::draw(), LLScrollableContainerView::draw(), LLLineEditor::draw(), LLComboBox::draw(), and LLColorSwatchCtrl::draw(). Definition at line 85 of file llviewborder.cpp. References LLImageProviderInterface::getUIImageByID(), mTexture, and LLUI::sImageProvider. Definition at line 324 of file llviewborder.cpp. Definition at line 94 of file llviewborder.h. Definition at line 88 of file llviewborder.h. Referenced by drawOnePixelLines(), drawTwoPixelLines(), getBevel(), and setBevel(). Definition at line 95 of file llviewborder.h. Referenced by draw(), drawTextures(), getBorderWidth(), and setBorderWidth(). Definition at line 97 of file llviewborder.h. Referenced by drawOnePixelLines(), drawTwoPixelLines(), and setKeyboardFocusHighlight(). Definition at line 91 of file llviewborder.h. Referenced by drawTwoPixelLines(), and setColorsExtended(). Definition at line 90 of file llviewborder.h. Referenced by drawOnePixelLines(), drawTwoPixelLines(), setColors(), and setColorsExtended(). Definition at line 93 of file llviewborder.h. Definition at line 92 of file llviewborder.h. Definition at line 89 of file llviewborder.h. Referenced by draw(), and getStyle(). Definition at line 96 of file llviewborder.h. Referenced by draw(), drawTextures(), and setTexture().